Organized alphabetically rather than by regions as in Kent. This book is enjoying an unexpected resurgence in popularity in 2010. This repertory is intended to serve as a handy and useful reference book. It is an attempt to lessen the difficulties of the prescriber. Remedies for a particular rubric are reduced to minimum possible by a careful selection. No drug is given unless there is strong justification provided for it, by authorities like Dr. Boger, Dr. Kent, Dr. Clarke's dictionary, etc. 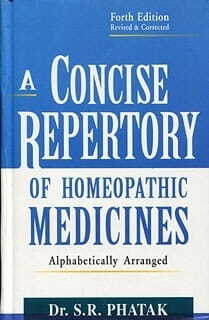 In this repertory, the headings including Mentals, Generals, Modalities, Organs, and their Sub-parts are all arranged according to their Alphabetical order. All the physiological and pathological conditions are also included. Cross references are given where-ever necessary.